Both series are episodic horror series that are both really creative in their storytelling. While the stories can range in quality, the ones that hit are truly atmospheric. Yami Shibai is a series of short horror stories, just like Ito Junji: Collection. Same author, bizarre stories, oddities, greasy terror. Do you absolutely hate yourself? Do you enjoy watching a brilliant mangaka's name being completely disgraced and dragged through the mud? Then look no further, I have the perfect alternative to the disaster of an adaptation that was Gyo, called the Junji Itou Collection. Why ruin just one of his stories when you could ruin them all? If you've never considered inflicting self-harm in the past, you might just take it up as a new hobby after finishing both of these utter travesties. Episodic series of horror shorts. QSYY is basically the Chinese version of this anime. Boogiepop Phantom is a loosly collected accumulation of episodic horror stories surrounding the titular Phantom, Boogiepop- an angel of death. 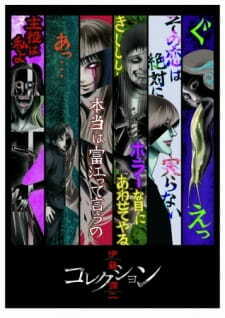 Junji Ito Collection has multiple sets of stories centered around multiple monsters that are also episodic. The two are horror, have short lived characters, and have good atmospheric buildup. The nature of the horror with its twilight zone feel is also similar. Both are horror series with tinges of black comedy (intentional or otherwise). Both are anime consisting of several short horror stories, if you enjoy the episodic storytelling nature of one, you are likely to enjoy the other. Both are episodic, while Aoi Bungaku Series adapts famous classic Japanese literature and is less about horror, it falls into same category with psychological and thriller and overall creepiness. Both are fairly similar in horror genre. Half-mocking stories and oddities. Ito Junji has some stories in school, similar with Inuki Kanako, as the characters Bukita and Souichi are clones.